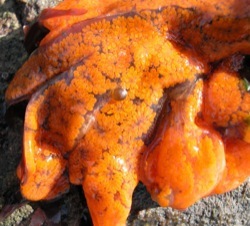 A colonial sea squirt in the genus Didemnum, which forms extensive sheets overgrowing a variety of substrates and attached organisms, has been found in a number of bays and harbors on the Pacific Coast of North America since 1993. The identity of this species is not yet known. A Didemnum with the same appearance and habits also showed up and spread along the New England coast since the late 1970s, in northern Europe since 1991, in New Zealand since 2001, and has apparently been present in Japan for several decades. How many species are involved in this, and whether they are native or exotic, are matters that are hotly debated by sea squirt taxonomists, and which will probably be resolved only by molecular genetic studies. In the meantime, I will here treat the newly discovered Didemnum species on both North American coasts as a single exotic species, which I will refer to as Didemnum sp. A.
Didemnum sp. 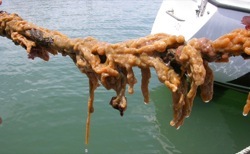 A has frequently been reported from bays and harbors on docks, boat hulls, ropes, pilings and other structures. In these situations the colony grows out in sheets that often grow over or fold over and fuse to other parts of themselves, forming irregular lobes that can be cylindrical and rope-like, flat, bulbous or branching and of considerable size, reaching as much as a meter in length. In New England, Didemnum sp. A has also been reported growing on gravelly bottom, forming encrusting mats that overgrow stones, shells and a variety of living organisms. The colonies can be tan, cream, yellow, orange or pinkish. They are most readily distinguished from other colonial sea squirts by their extensively lobed form. The following details may be seen with a microscope and some dissection. Each colony of Didemnum sp. A consists of many small individuals called zooids, each about a millimeter in length, embedded in the sheet-like matrix. Each zooid pumps water through its body, filtering out food particles, and along with neighboring zooids discharges the filtered water into a common space from which it exits the colony. Embedded in a thin layer in the surface of the matrix are tiny, spiny, calcareous balls, each one shaped like the head of a medieval mace. Didemnum sp. A grows subtidally in bays, harbors and coastal waters, on rocks and all kinds of artificial structures, and on gravel and boulders. It has not been reported on mud or sand bottoms that lack gravel or cobbles. It has been observed overgrowing seaweeds, sponges, hydroids, anemones, limpets, oysters, mussels, scallops, barnacles, bryozoans and other species of sea squirts. In New England it is common to depths below 30 m and has been found down to 65 m. It can tolerate temperatures from -2° C to 24 ° C, and in San Francisco Bay has been collected only at salinities above 26 ppt. Didemnum sp. A broods its larvae within the colony's matrix. When released, the larvae would spend a few hours in the plankton before attaching head down to a firm surface and metamorphosing into the initial zooid of a new colony. Larval settlement has been observed in summer and fall. In addition, Didemnum sp. A can produce new colonies through fragmentation. 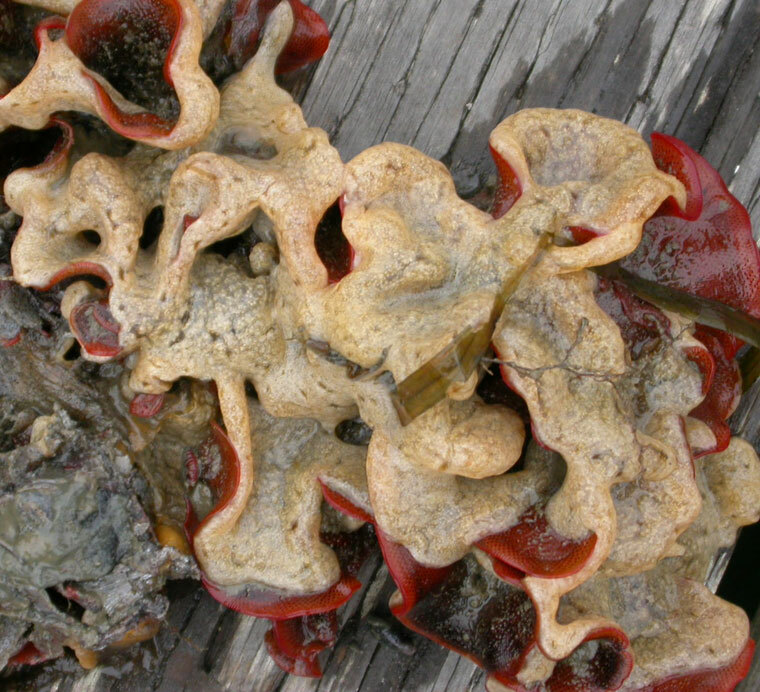 Lobes from a colony can break off, drift to a new site, settle or become entangled in the bottom, and grow out over the substrate. 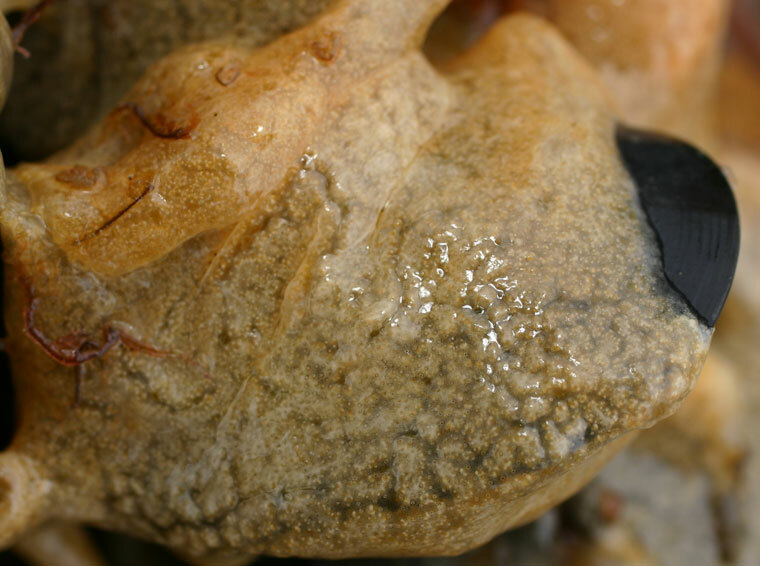 Because it rapidly fouls and overgrows both structures and shellfish, Didemnum sp. A has great potential to become a significant aquaculture pest, particularly for the cultivation of mussels. It may also have a substantial impact on natural environments. In the Northwest Atlantic, it has infested a 100 square km area on Georges Bank, with coverage of 50-90% of the bottom over large parts of this area. 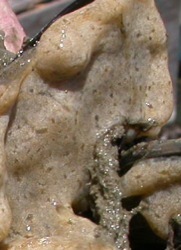 Such coverage can smother organisms living on the bottom an in the sediment, and block the settlement of larvae. Didemnum sp. A differs from most types of sea squirts in having spiny, calcareous balls embedded in the surface of its matrix. 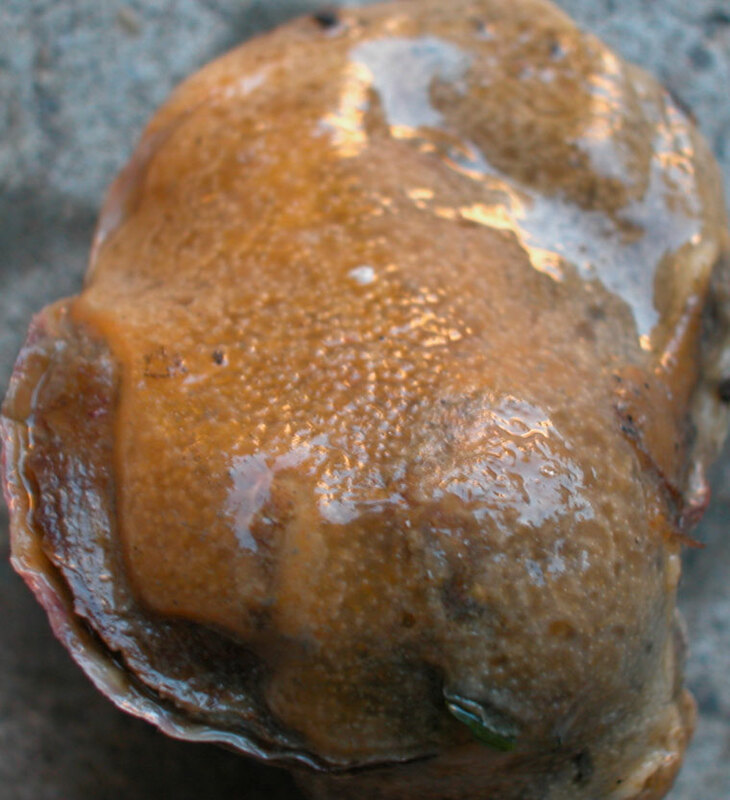 Three related species on the Pacific Coast, Didemnum carnulentum, Didemnum albidum and Trididemnum opacum, have similar spiny balls but these are embedded in both the surface and deeper parts of the matrix; the colonies are always flat and encrusting, never lobed; and are predominantly white or gray, in contrast to the mainly tan, yellow or orange colonies of Didemnum sp. A. Within some of the bays where it has been found, Didemnum sp. A already seems to be distributed fairly broadly. It has been collected from two sites near Powell River in the Strait of Georgia (on mussel aquaculture rafts in Okeover Inlet and in Agamemnon Channel on Nelson Island), at three sites in southern Puget Sound (a Des Moines marina, an underwater park at Edmonds, and on mussel rafts in Totten Inlet), at seven sites in Humboldt Bay, and at four sites in Bodega Harbor. In San Francisco Bay, it has been collected from many sites in or near the Central Bay, from Richmond in the north to San Leandro in the south, and to nearly the mouth of the bay. Didemnum sp A. was probably introduced in hull fouling, as colony fragments in ballast water (its larvae do not spend a long enough time in the plankton to be transported across or between oceans in ballast water), or possibly with oysters or other shellfish stock. Its discovery in Washington and British Columbia on mussel rafts owned by the same company suggests that transfers of shellfish stock or aquaculture equipment may play a role in coastwise spread, probably along with transport as fouling on boat hulls. Eastern North America [collected at Damariscotta River in Maine in 1993, with observations by reliable sources since the late 1970s], in bays and coastal sites from Maine to Connecticut, on Georges Bank  in the central Gulf of Maine, and on Stellwagen and Tillies banks off the coast of Massachusetts. A similar Didemnum species has recently been reported as spreading in The Netherlands [collected in 1991] and northern France [collected in 2001]. A similar Didemnum was also discovered in New Zealand in Whangamata Harbor on the north coast of the North Island [collected in 2001], and then on a barge and the seabed beneath it near Picton on the north end of the South Island. It may also be present at Tauranga Harbor, on the north coast of the North Island. A similar Didemnum has also been described from Japan in the Sea of Japan, with possible records dating back to the 1920s or 1930s. 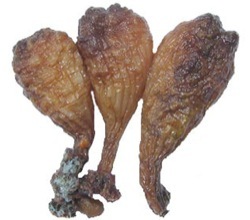 Although Kott (2002) described the New Zealand Didemnum as a native species, which she named Didemnum vexillum, and described the eastern North American Didemnum as another native species, which she named Didemnum vestum (Kott 2004), the recent discovery of similar forms of Didemnum on the four ocean coasts of Europe, eastern and western North America, and New Zealand, which some taxonomists believe are all identical, suggests that these are all the same exotic species spreading rapidly around the world, with a possible origin in Japan. Mechanisms could include transport with shipments of aquaculture stock, in hull fouling or as colony fragments carried in ballast water. Coutts, A.D.M. 2002. A biosecurity investigation of a barge in the Marlborough Sounds (New Zealand). Cawthron Institute Report 744, Cawthron Institute, Nelson, New Zealand. Kott, P. 2002. 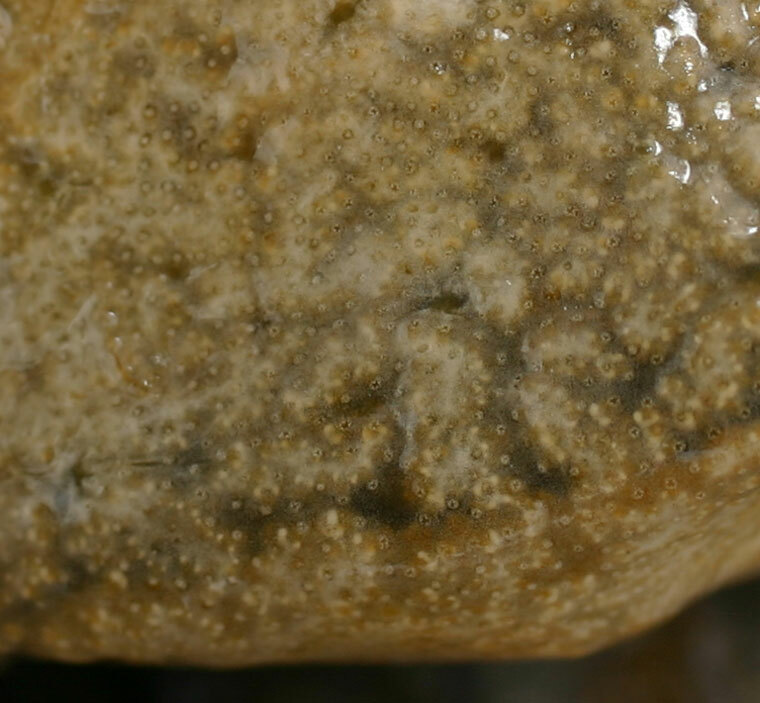 A complex didemnid ascidian from Whangamata, New Zealand. Journal of the Marine Biological Association of the U.K. 82: 625-628. Kott, P. 2004. A new species of Didemnum (Ascidiacea, Tunicata) from the Atlantic coast of North America. Zootaxa 732: 1-10. 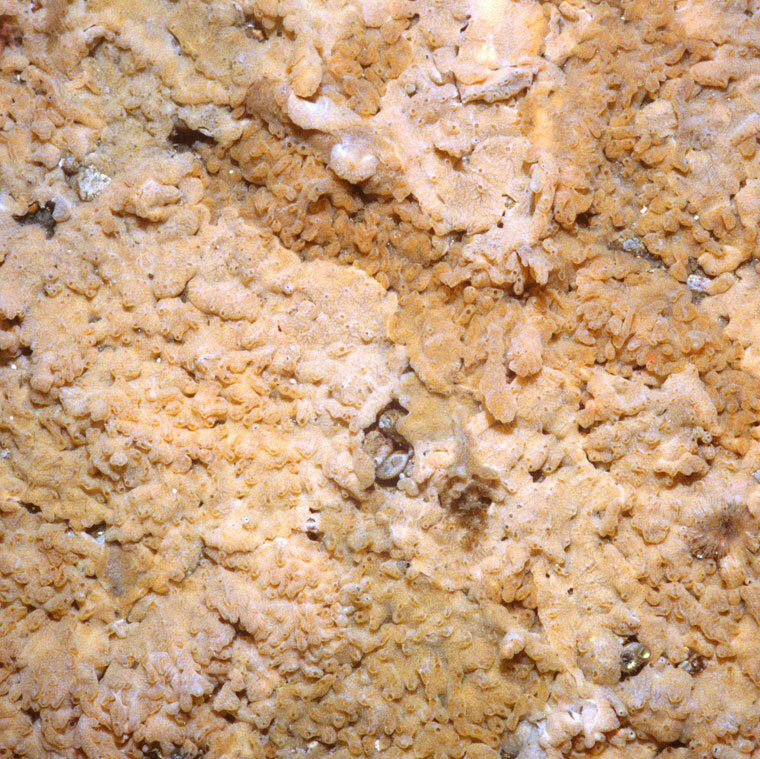 A massively lobate colony of Didemnum sp. A growing on a rope at Sausalito in San Francisco Bay. Didemnum sp. A growing over a rope at Sausalito. Didemnum sp. 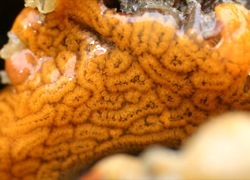 A covering a bryozoan (Watersipora subtorquata) in San Francisco Bay. Didemnum sp. A overgrowing a bay mussel (Mytilus trossulus-galloprovincialis) in San Francisco Bay. Didemnum sp. A covering a native oyster (Ostrea lurida) in San Francisco Bay. A pendulous specimen of Didemnum sp. A from Bodega Harbor. Detail of a Didemnum sp. 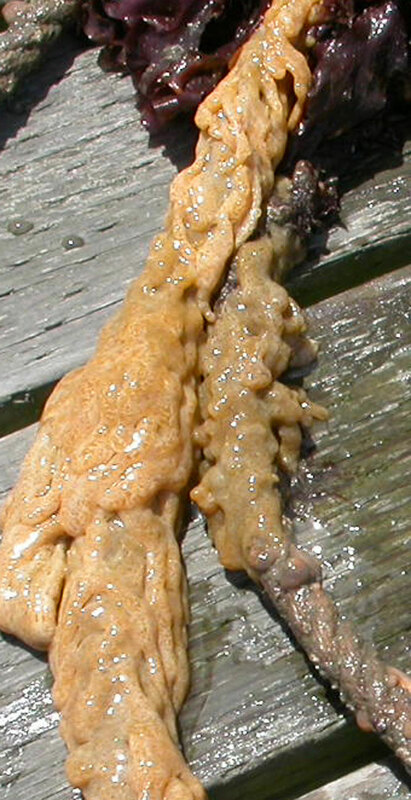 A colony from San Francisco Bay. 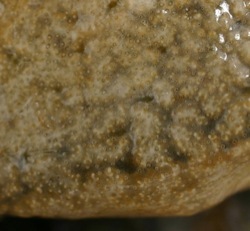 Closeup of the surface of a Didemnum sp. A colony, from San Francisco Bay. Didemnum sp. 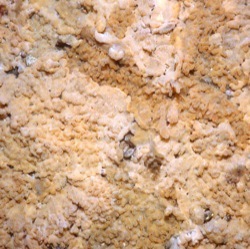 A covering gravel bottom at 47 m depth on Georges Bank in the Gulf of Maine.